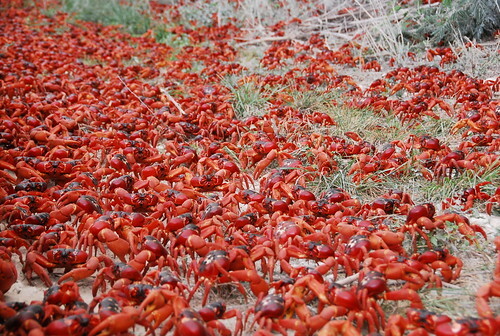 Christmas Island, a small Island in Indian Ocean, is home to about 120 million Red Crabs who migrate from the forest to the coast each year during the breeding season. 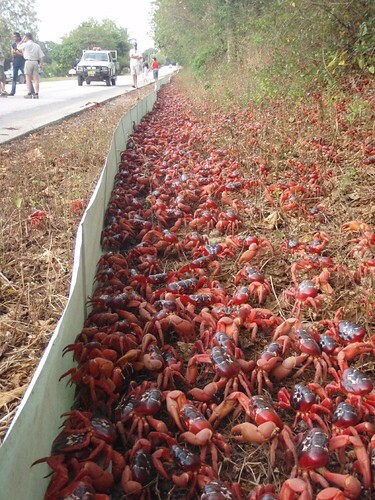 At the start of the annual rainy season (last quarter of each year), fully grown Red Crab begin their migration from their burrows in the forest to the coastal areas of the Island. It is thought that biological programmimg triggers the migration and almost entire adult population of Red Crab (about 50 million) starts moving almost simultaneously to try to reach the coast at the time of high tide during last quarter of the moon in the rainy season. At the coast the female crabs release their eggs in water and once the eggs hatch the young crabs alongwith the adults start back their trek to the forest. During the migration, the crabs cover the routes to the coast so densely that from the air the entire island looks like a creepy crimson carpet. The to and fro migration takes about 3-4 weeks and during this period the crabs are almost every where - one the road, in the house, on the lawns, on the beaches and even in the public lavatories. 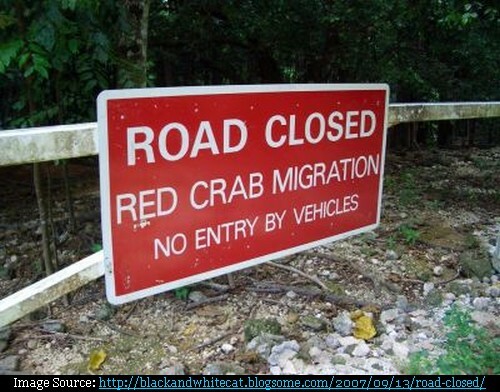 During migration some roads are closed to the vehicular traffic and national park rangers/volunteers erect temporary barriers to control the juggernautic movement of red crawleys. 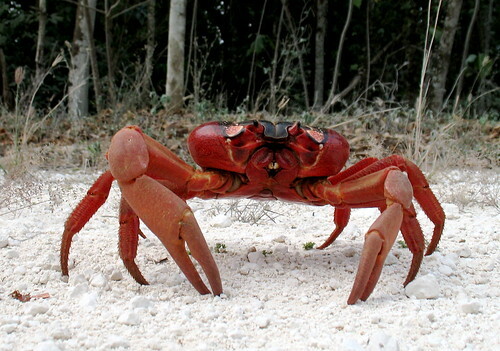 There are signs like these all over Christmas Island advising people to look out for the crabs. The entire event is often described as one of the world's most impressive wildlife migrations and has to be seen to be believed. Perhaps this video can show to some extent the massive scale of the migration. Animals are driven to migrate by the sun. The only thing that stays constant is where the sun will be. Crabs, whales, penguins and a lot of other animals migrate because of the placement of the sun.